Happy New Year @Ray&Donna ! Thank you for all the work you put into this thread. Oh and I got the complete series of Petrocelli for Christmas so I am really looking forward to rewatch season one without German dubbing and then watch season two! First caps from "Little Boy Lost". The Krebbs at the bank. Great screen Ray&Donna! 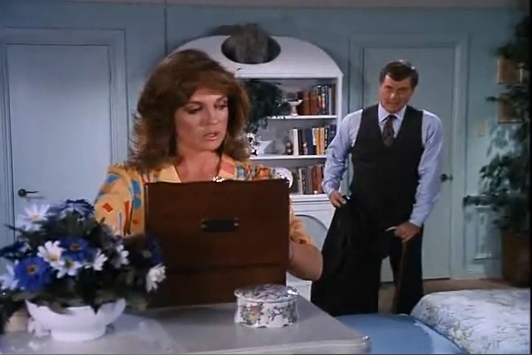 I love your thread dedicated to Mr and Mrs Ray Krebbs and original Dallas. I look forward to seeing what new things you will be posting for us in 2019. Original Dallas rocks! At Southfork, there is some concern for Pam's health. Later, Donna takes Miss Ellie to John Ross's custody hearing, thwarting J.R.'s plan to smear Sue Ellen. Haha I see what you mean. It does look like it would have fit in better there. yet there's nothing wrong with having some books in your bedroom. The Krebbs get no love in "The Sweet Smell of Revenge". Ray appears in a brief business scene while Donna gets the week off. In this first scene from "The Big Shut Down", the Krebbs talk to Bobby about Pam. Happy birthday to Susan, who is 75 today! Great photos of the birthday girl! Thanks for sharing. Great screen caps Ray&Donna and Happy 75th Birthday Susan Howard. I love this thread dedicated to Ray and Donna. Original Dallas rocks. More from "The Big Shut Down"
Donna and Miss Ellie continue their conversation, and then Ray has another business meeting. Great screen caps Ray&Donna. I love your thread dedicated to Mr and Mrs Krebbs. It is sad that we didn't get a happy ending for this amazing couple. Original Dallas rocks.